Tradition has long given vampires the ability to transform into other creatures of the night, most often bats. 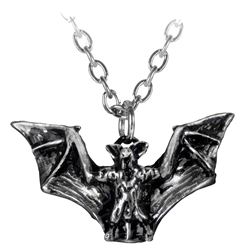 The Vampyr Pendant recreates this concept by depicting a transformed vampire as he takes flight. This vampire pendant represents the vision of the nocturnal nightmare, sending a spike of fear into the heart of whoever sees it. The wings of the bat are spread wide to catch the evening air. This gothic pendant is crafted by hand from the finest English pewter, giving it a fantastic gleam. To keep maintain the brilliance of your gothic Vampyr pendant, clean it occasionally with a quality metal polish.